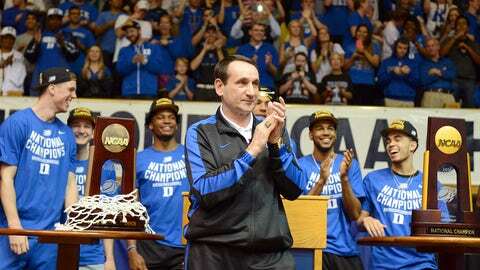 Duke coach Mike Krzyzewski has already guided the United States to two gold medals heading into the 2016 Olympics. Duke coach Mike Krzyzewski, who has coached the U.S. men’s basketball team to back-to-back Olympic gold medals, will step down after the Rio 2016 Games, ESPN.com reported. "It definitely is," his final Olympics, Krzyzewski said, according to the report. "Hopefully we can finish things up well with Rio and I would move onto something else with USA Basketball," Krzyzewski said, according to the report. USA Basketball president Jerry Colangelo indicated earlier this year he expected Krzyzewski would leave after Rio 2016. Krzyzewski, 68, was hired as the U.S. coach following the 2004 Olympics in Athens, where the United States lost three games and took only a bronze medal under Larry Brown. The U.S. men, who won Olympic golds in Beijing and London, have gone 75-1 under Krzyzewski. The loss came to Greece in the 2006 FIBA World Cup semifinals. Krzyzewski, also an assistant coach for the 1984 and 1992 U.S. Olympic champion teams, wouldn’t comment on who should replace him. But he did say the next coach should have international experience.